Give your homeschool senior a memorable, meaningful, life-prep writing curriculum with 7Sisters’ High School Guide to Senior Year Writing! You may schedule the assignments in any order you choose. If you purchased each of the included writing guides individually, your cost would be $39.96. Purchasing this bundled High School Guide to Senior Year Writing curriculum gives you all of the same resources for $29.99! Download it today! 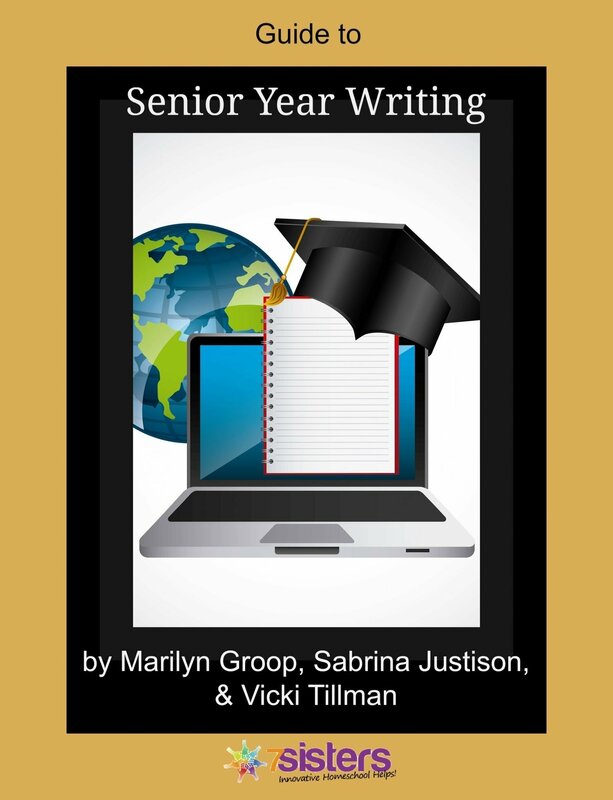 Click HERE to view EXCERPTS from High School Guide to Senior Year Writing. Want more information on each of the guides included in High School Guide to Senior Year Writing? Click on the above links or read below. A High School Guide to Professional Writing equips senior-year students (or other accomplished high school writers) for 11 types of writing commonly applied in workplace or community scenarios. High School Guide to Professional Writing offers 13 weeks of instruction in a step-by-step, conversational style that refuses busywork and reassures students that this schoolwork will be of use to them in REAL LIFE after graduation. Chicago style is the creation of the University of Chicago Press. It is an old and successful format that has been re-popularized with several variations. Chicago style NB format (Note-Bibliography), Chicago-Style Research Paper Writing Guide follows that format. Click here to view EXCERPTS from Chicago Style Research Paper Writing Guide. Help is here for writing the all-important college application essay in this 10-page downloadable ebook text! Homeschooling seniors applying to colleges need to be able to communicate their thoughts in a clear and persuasive manner, paying close attention to the details that are uniquely effective in a college application essay. 7Sisters’ Guide to Writing a College Application Essay builds confidence in high school juniors and seniors through a conversational style of instruction that will help them write those essays with excellence and gain positive attention from college admissions offices. Are you looking for a unique writing assignment for your student’s senior year or as an additional assignment for a student who is creative and loves to write? Maybe you’d like to equip your student to create a group yearbook, or a written gift to commemorate a special event or milestone in your family. High School Guide to Creative Chroniclingoffers all of this and more. This high school guide does more than just teach writing. It encourages students to combine writing with computer skills and photography to create a chronicle of lasting memories.